The dreaded puppy teeth. Those unnervingly sharp little daggers hidden behind that adorable little face. Ouch! Much like human babies, puppies explore their new surroundings by taking anything and everything they find and putting it in their mouth. Unlike human babies, a puppy’s mouth is not filled with soft gums, but needle-like teeth. It can be surprising just how much it hurts the first time a puppy chomps down on your arm or finger. But the real problem is when you realize that those cute little puppy bites might turn into a permanent habit, which is definitely not as cute or harmless in an adult dog. Puppies begin their lives with about 30 vicious little teeth in their mouths. As they grow into adults, those teeth fall out and are replaced by about 40 proper dog teeth. Much the same as a human, the process of new teeth growing into place can be quite painful and the puppy’s response is to chew, gnaw, and mouth anything that makes them feel better. Puppies also nip at each other during play. You’ve probably noticed that puppies and adult dogs often play by lunging at one another, mouths-first. This is usually a normal part of being a dog, but unchecked “playful” nipping can eventually progress to full-blown (and dangerous) biting. And your puppy will probably try to nip at you during your early rough-housing sessions. This can actually be fairly painful, but even when it’s not it’s still good to curb these behaviors early — before they get worse. You’ll find that it’s quite easy to tell the difference between teething and nipping with your puppy. Teething will usually take the form of your puppy gnawing or lightly nibbling on your fingers or the fleshy part of your hand. Nipping will usually accompany an excited puppy during playtime. If your puppy starts nipping at you it’s important to quickly (but correctly) establish that this is not OK.
For example, if you’re playing with your puppy and they nip at your hand, calmly make a neutral noise, like “oops,” and immediately stop playing and ignore your pup until they are no longer in a nipping or overly excited mood. Once they’ve settled, give them praise and a treat if you have one nearby. This will show your puppy that biting means playtime is over and will only resume when they’re calm. It shouldn’t take long for your puppy to figure out that it’s better to be calm and gentle so they can continue to play with you, the most awesome thing on the planet, as far as they’re concerned. 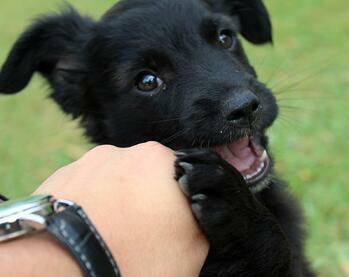 You should take the same approach if your puppy starts gnawing or teething on you. Let them know it hurts and stop whatever you’re doing. For example, if they’re sitting in your lap and start chewing your fingers, exclaim “ouch!” and remove them from your lap. If they continue to chew, you can even get up and walk out of the room. Also be sure to reward them with praise and treats when they can sit with you and not use you as a human chew toy. DO NOT yell at or hit your puppy. Doing so will be less effective at stopping the biting, it will probably make your puppy afraid of you, and it will very likely result in a more-aggressive dog as they get older. Note: If you notice any aggressive tendencies in your puppy, the time to act is now. As mentioned above, do not hit, yell at, or otherwise punish or "dominate" your puppy, all of which will only aggravate and encourage these tendencies. Instead, work extra hard to reward your puppy when they’re behaving calmly and keep them out of situations and areas where their aggression shows through. These small steps will help to keep everybody safe as you help shape your puppy into a calm, well-behaved dog. 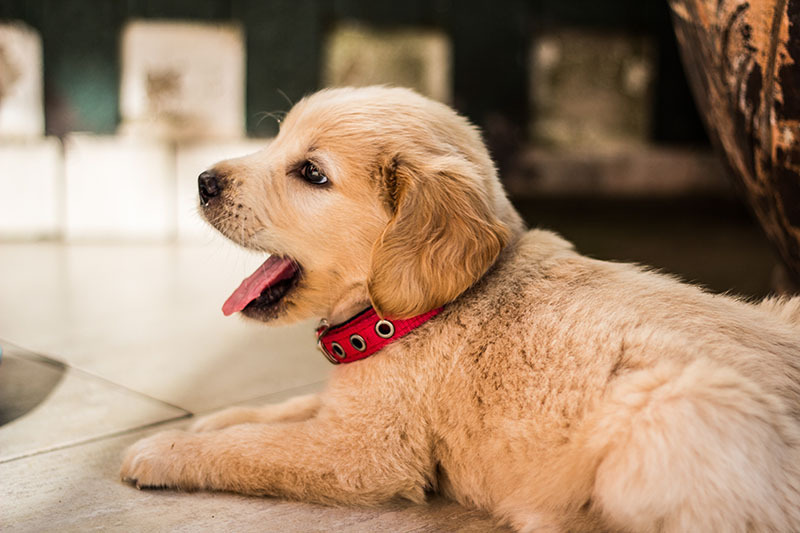 If your puppy continues to bite or show aggressive tendancies, talk to your vet or a board-certified veterinary behaviorist and get the help necessary to prevent your aggressive puppy from growing up to be an aggressive (and much more dangerous) adult dog. At this stage in your dog’s life your best bet is to get a rubber chew toy of the appropriate size and firmness for your teething puppy. The immensely popular Kong toys are an especially good outlet for a puppy going through the pain of teething. You can even throw one of these in the fridge or freezer, as the cold temperature will feel really good on your puppy’s sore gums. In general, the best option is something that is firm (such as a rubber toy) but not so hard that it will hurt your puppy’s teeth. A good rule of thumb is to use the thumbnail test: Just press your thumbnail into the toy. If it gives a little, it’s probably safe for your puppy. If not, then it’s best to pass and find a better, more tooth-forgiving option. This goes for adult dogs as well. While we’re talking about teeth, you should also remember to go in for regular annual dental cleanings to keep your puppy’s new, permanent teeth clean and healthy. In the meantime, you can even give your puppy (or adult dog) regular tooth brushings. There are a number of dog-specific toothbrushes and toothpastes. It’s best to find a product that has been approved by the Veterinary Oral Health Council. However, never use human toothpaste on your dog. Some toothpastes include a sugar-free sweetener, xylitol, which is extremely toxic to dogs even in small doses. Have any more puppy questions? Let us know!